This rich ethnography explores beliefs and practices surrounding aging in a rural Bengali village. Sarah Lamb focuses on how villagers' visions of aging are tied to the making and unmaking of gendered selves and social relations over a lifetime. Lamb uses a focus on age as a means not only to open up new ways of thinking about South Asian social life, but also to contribute to contemporary theories of gender, the body, and culture, which have been hampered, the book argues, by a static focus on youth. Lamb's own experiences in the village are an integral part of her book and ably convey the cultural particularities of rural Bengali life and Bengali notions of modernity. In exploring ideals of family life and the intricate interrelationships between and within generations, she enables us to understand how people in the village construct, and deconstruct, their lives. At the same time her study extends beyond India to contemporary attitudes about aging in the United States. 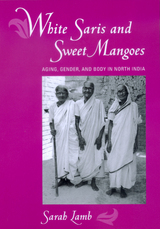 This accessible and engaging book is about deeply human issues and will appeal not only to specialists in South Asian culture, but to anyone interested in families, aging, gender, religion, and the body. Sarah Lamb is Assistant Professor of Anthropology at Brandeis University.